Ubiquitin : Exists either covalently attached to another protein, or free (unanchored). When covalently bound, it is conjugated to target proteins via an isopeptide bond either as a monomer (monoubiquitin), a polymer linked via different Lys residues of the ubiquitin (polyubiquitin chains) or a linear polymer linked via the initiator Met of the ubiquitin (linear polyubiquitin chains). Polyubiquitin chains, when attached to a target protein, have different functions depending on the Lys residue of the ubiquitin that is linked: Lys-6-linked may be involved in DNA repair; Lys-11-linked is involved in ERAD (endoplasmic reticulum-associated degradation) and in cell-cycle regulation; Lys-29-linked is involved in lysosomal degradation; Lys-33-linked is involved in kinase modification; Lys-48-linked is involved in protein degradation via the proteasome; Lys-63-linked is involved in endocytosis, DNA-damage responses as well as in signaling processes leading to activation of the transcription factor NF-kappa-B. Linear polymer chains formed via attachment by the initiator Met lead to cell signaling. Ubiquitin is usually conjugated to Lys residues of target proteins, however, in rare cases, conjugation to Cys or Ser residues has been observed. When polyubiquitin is free (unanchored-polyubiquitin), it also has distinct roles, such as in activation of protein kinases, and in signaling. Cellular protein degradation pathways can be utilized by viruses to establish an environment that favors their propagation. Here we report that the Kaposi's sarcoma–associated herpesvirus (KSHV)-encoded latency-associated nuclear antigen (LANA) directly functions as a component of the EC5S ubiquitin complex targeting the tumor suppressors von Hippel-Lindau (VHL) and p53 for degradation. We have characterized a suppressor of cytokine signaling box-like motif within LANA composed of an Elongin B and C box and a Cullin box, which is spatially located at its amino and carboxyl termini. This motif is necessary for LANA interaction with the Cul5–Elongin BC complex, to promote polyubiquitylation of cellular substrates VHL and p53 in vitro via its amino- and carboxyl-terminal binding domain, respectively. In transfected cells as well as KSHV-infected B lymphoma cells, LANA expression stimulates degradation of VHL and p53. Additionally, specific RNA interference–mediated LANA knockdown stabilized VHL and p53 in primary effusion lymphoma cells. Thus, manipulation of tumor suppressors by LANA potentially provides a favorable environment for progression of KSHV-infected tumor cells. LANA is predicted to form a complex with Cul5/Rbx1 that interacts with Elongin BC but not LANA ΔSOCS (Cul box and BC box) mutant. LANA acts as adapter to link substrates which bind at its amino (1) or carboxyl (2) -terminal domain ( like VHL and p53 ) to EC5S ubiquitin complex and induces the pathway of ubiquitin E1 activation, E2 conjugation, and substrate polyubiquitylation as well as 26S proteasome–mediated degradation. The ubiquitin system of protein modification is a crucial mechanism involved in the regulation of a wide array of cellular processes and in the development of various human diseases. In the ubiquitination cascade E1 can bind with dozens of E2s which can bind with hundreds of E3s in a hierarchical way. The resulting modification of the proteins sends them to the proteasome for the degradation. Protein modifiers which can be covalently attached to target lysines either as a monomer or as a lysine-linked polymer. Attachment to proteins as a Lys-48-linked polymer usually leads to their degradation by proteasome . Attachment to proteins as a monomer or as an alternatively linked polymer does not lead to proteasomal degradation and may be required for numerous functions, including maintenance of chromatin structure, regulation of gene expression, stress response, ribosome biogenesis and DNA repair (see below). The ubiquitin system is a highly regulated enzymatic cascade in which a ubiquitin-activating enzyme (E1) activates the 76 amino acid protein UBIQ (ubiquitin) in an ATP-dependent manner and transfers it to the active site cysteine of ubiquitin-conjugating enzymes (E2s) . Ubiquitin ligases (E3s) have a central role in the process of protein modification with UBIQ (known as 'ubiquitination' or 'ubiquitylation'): they recognize specific substrates and facilitate UBIQ transfer from the E2 onto the substrate. Although the precise number of human E3s is unknown, about 500 or more have been proposed to exist , supportive of the broad role for the ubiquitin system in regulating diverse cellular processes. We want to underline that E1 needs ATP-Mg2+ for its reaction (till what extents could Mg regulate the activity of this enzyme? Pleiotropic effects of ATP.Mg2+ binding in the catalytic cycle of ubiquitin-activating enzyme.). Ubiquitin-like proteins (UBLs) have also been identified with varying degrees of identity to UBIQ and are conjugated onto proteins through similar enzymatic cascades as UBIQ (e.g. NEDD8 ) (could be useful another file on this). Numerous deubiquitylating enzymes (DUBs) have roles in processing polyubiquitin precursor proteins and may also have regulatory roles, e.g. counteracting the ubiquitylation of a particular protein by its cognate E3 and/or proofreading synthesized UBIQ chains. There are also emerging roles for DUBs in disease (could be useful another file on these). the second class of E3s, which contains RING-type and structurally related ligases, facilitates the direct transfer of UBIQ from E2 onto substrate. In general, E3s facilitate covalent UBIQ transfer by properly positioning the site to be modified. Lysine residues appear to be major sites of UBIQ attachment on proteins, although N-terminal and cysteine modifications have also been reported . Throughout this mechanism, the E1 enzyme is bound to two ubiquitin molecules. Although this secondary ubiquitin is similarly adenylated, it does not form the same thioester complex described previously. The function of the secondary ubiquitin remains largely unknown, however it is believed to facilitate conformational changes observed in the E1 enzyme during the transthioesterification process. The ubiquitin protein itself consists of 76 amino acids and has a molecular mass of about 8.5 kDa. Key features include its C-terminal tail and the 7 Lys residues. 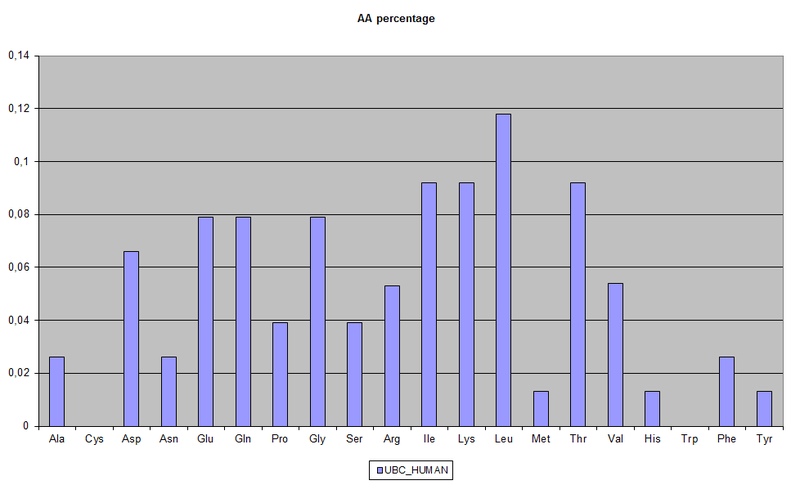 It is highly conserved among eukaryotic species: Human and yeast ubiquitin share 96% sequence identity. 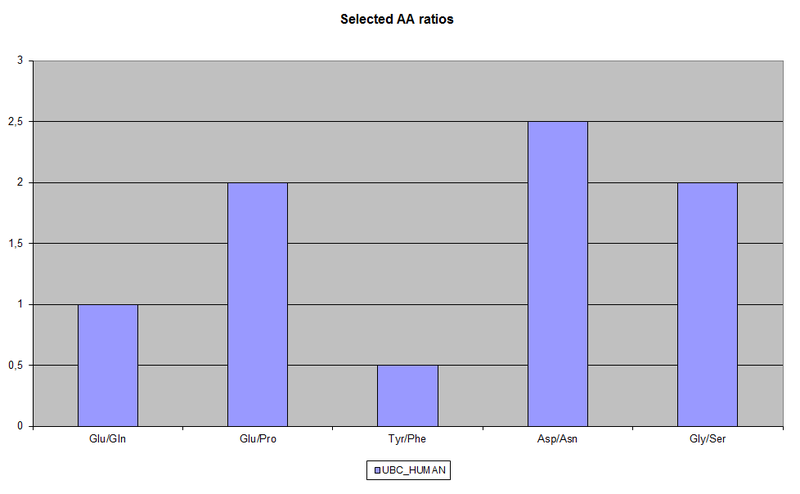 E1 is around 60aa, E2 around 150aa and E3 is quite variable but usually 800aa. We have chosen three representatives of this 3 categories (see above “database: uniprot” for further informations). As in the proteasomes subunits, W is quite low. Great gap from Ub to E3 in Q level (activation in different conditions? Check Km and cofactor would be really interesting (open question). However, ubiquitin is believed to have descended from prokaryotic proteins similar to ThiS or MoaD: these prokaryotic proteins, despite having little sequence identity (ThiS has 14% identity to ubiquitin), share the same protein fold and also share sulfur chemistry with ubiquitin. MoaD, which is involved in molybdenum cofactor biosynthesis, interacts with MoeB, which acts like an E1 ubiquitin-activating enzyme for MoaD, strenghtening the link between these prokaryotic proteins and the ubiquitin system. In the animals (in plants also other roles) Mo is necessary for the degradation of purine and the yelding of uric acid. In some animals the integration of the diet with Mo improve the growth (could UPS regulates this pathway? open question). Ub: Subcellular location, cytoplasm and nucleus (like protesomes). Post-translational modification: several types of polymeric chains can be formed, depending on the lysine used for the assembly (see above). Ubiquitin is synthesized as a polyubiquitin precursor with exact head to tail repeats, the number of repeats differs between species and strains. In some species there is a final amino-acid after the last repeat while in humans we can observe a Val (meaning of this? Open question). Some ubiquitin genes contain a single copy of ubiquitin fused to a ribosomal protein (either L40 or S27a). Ubiquitin is recycled after the target is commited to the proteasome. The E1 gene informs us that the Y chromosome derived from the X chromosome! The protein encoded by the tumor suppressor gene VHL (von Hippel-Lindau) serves as a substrate receptor for a CUL2-based ubiquitin ligase . Mutations in VHL are associated with lung cancer, sporadic clear cell renal carcinomas and an autosomal dominant familial cancer known as von Hippel-Lindau disease . Many of these mutations prevent VHL associating with the other subunits of its ubiquitin ligase. A substrate for this ubiquitin ligase is a marker of tumor hypoxia, the transcription factor HIF1A (HIF1α, hypoxia-inducible factor 1α ), which stimulates angiogenesis . Numerous biochemical and structural studies have determined that HIF1A binds to VHL when hydroxylated on two proline residues through the activity of prolyl hydroxylases, which results in its ubiquitylation and ultimate degradation . 3.Cervical cancer is linked to HPV infection and involves downregulation of P53 and RB (Rb). P53 is degraded via E6 (virus) and E6AP (human). 5.Colorectal cancers are associated with defects in the regulation of CTNB1 (β-catenin) stability through mutations in adenomatous polyposis coli. 7.The Fanconi anemia pathway involves a ubiquitin ligase complex and is associated with increased cancer susceptibility. Upon DNA damages, usually, two proteins in this pathway are mono-ubiquitylated; FACD2 (FANCD2) and FANCI , and recruited to chromatin within nuclear foci. In this disease this pathway is corrupted (see RESPONSE TO DOUBLE-STRAND BREAKS ). 8.HIV encodes proteins that hijack cellular cullin-RING ubiquitin ligases. Two HIV-encoded proteins, VIF and VPU, interact with distinct cullin-RING ubiquitin ligases to hijack their activity and promote the ubiquitylation of cellular proteins. 9.Herpesviruses encode ubiquitin ligases and modulate cellular ubiquitin ligases. 11. Metabolic diseases such as diabetes could have associated defects in some aspects of the ubiquitin system: in effect it has been associated with insulin signaling through the regulation of the stability of insulin receptor substrate (IRS) proteins. 16. Cell Cycle (KEGG ). MdM2 is an E3! (see ATM substrates ). 1.Ub transcription is regulated by PPAR beta/delta in skeletal muscle and adipocyte. At the present many drugs target the PPAR system. (open question). 3. Osteopontin regulates ubiquitin-dependent degradation of Stat1 in murine mammary epithelial tumor cells. It is possible to find the two forms, free ubiquitin and multiubiquitin chains, in human serum using immunoassays. Serum concentrations of multiubiquitin chains and free ubiquitin are substantially higher in rheumatoid arthritis and hemodialysis patients, respectively, than healthy subjects. Additionally, in acute viral hepatitis, serum multiubiquitin chain concentrations are increased in the acute phase, decreased in the recovery phase, and correlated with alanine and aspartate aminotransferase activities (r = 0.676 and 0.610, P <0.0001 and <0.001, respectively). Therefore, serum ubiquitin may have prognostic value. COULD UB BRINGS OTHER MESSAGES? 76aa COULD INFORM OTHER CELLS OF MANY THINGS. Morever, ubiquitination (analyzed by immunohistochemisty in this case) can be used as predictive marker of recurrence in hepatocellular carcinoma.